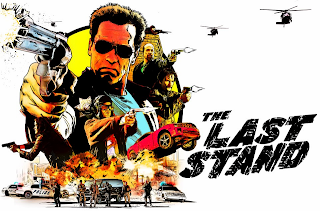 Release Date: January 18, 2013 – U.S.
Arnold Schwarzenegger is old. It's impossible not to notice. 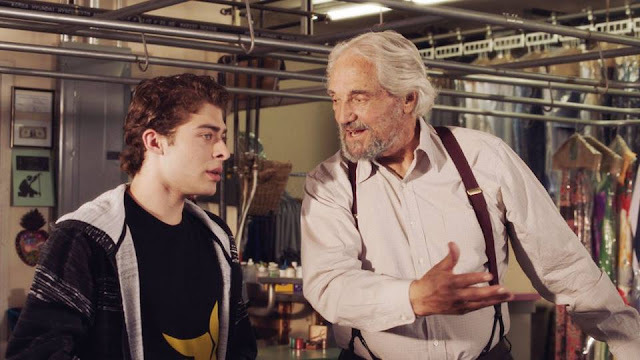 But he wears his age well in "The Last Stand," his first starring role in ten years. It's a wild ride that was well worth the wait. 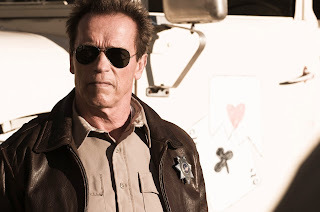 Ray Owens (Schwarzenegger) is the sheriff of a small town: Summerton, Arizona. Before that, he was a Los Angeles police officer – until he eventually decided that he could take no more of the violence and bloodshed he had to face on a daily basis. In quiet, quaint Summerton, a car illegally parked in a fire zone is what passes for a major crime scene. As the movie begins, Ray is ordering breakfast in a diner when he notices a suspicious pair of truckers (the main one is played by Peter Stormare, who would look shady even at his own autograph signing). The sheriff orders his inexperienced, inept team of deputies – Jerry (Zach Gilford), Sarah (Jaimie Alexander), and Figuerola (a paunchy Luis Guzmán) – to run the license plate on the computer. Jerry has a bandaged nose after accidentally shooting himself bloody during target practice. Not only is he incapable of handling a gun, he is also incompetent around technology. Figuerola sighs and tells him to pay attention. A few keystrokes later and they find out the truck is registered to Burrell (Stormare's character). How would these clueless Barney Fifes ever cope with a real crime? Of course, it doesn't take long for them to find out. The milkman is murdered (Harry Dean Stanton in a brief appearance). Figuerola thinks it's a burglary gone bad. The sheriff knows better. Meanwhile, in Las Vegas, a dangerous Mexican cartel boss has just escaped. Gabriel Cortez (Eduardo Noriega) pulls out all the stops to make his getaway: an airlifted van, shooters in ninja outfits, several decoys running around in orange prison jumpsuits, and a souped-up racecar. In other words, just another normal night in Vegas! It's up to an FBI team, led by Agent John Bannister (Forest Whitaker), to track and stop Cortez. The escaped cartel leader – "a psychopath in a Batmobile" – may be headed to Summerton. Bannister calls the sheriff to warn him of the possibility, only to later to dismiss the idea outright. It must be a movie rule that the big city FBI agent is always wrong and the small town lawman has all the answers. Then again, to be fair, would you believe a "pissant county sheriff" with an Austrian accent babbling about a temporary bridge the bad guys have built to cross the border? The Oscar-winning Whitaker brings depth and credibility to what could have been a one-dimensional role on paper. Sheriff Ray prepares for war by bringing out reinforcements: a flaky former Marine (Rodrigo Santoro) and a country kook (Johnny Knoxville) with a large collection of vintage guns that just happen to be perfect for an Arnold Schwarzenegger flick. Oh, and there's a school bus too. Just another pleasant morning in Summerton! "The Last Stand" is vintage Schwarzenegger: witty one-liners, over-the-top action, and just plain fun. It never quite scales the heights of his all-time classics, such as "Total Recall" and "T2," but it's a worthy addition to his filmography and a great welcome back party. This movie is a big, cheesy, mindless, dumb action film, but that's what it’s supposed to be. Nice review Chris. Thanks, Dan. I didn't expect it to be so much fun, but it hit all the right notes for me.